In July I went to Wales for a week to learn to swim in a residential swimming course. I knew after that week that being able to swim would change my life but, when I left the course I still had some reservations. During the course we didn’t go out of our depth. We didn’t learn to tread water. We learnt to have confidence in the water, we learnt breaststroke and elementary backstroke and we learnt to float. But, because I hadn’t yet been out of my depth I didn’t know if I could actually do it. I didn’t know if I could actually swim confidently where I couldn’t touch the bottom and until we went on holiday last month I still wasn’t sure if I could do everything I wanted to do. But, I knew I was prepared to give it a go – which was a massive step forward to where I was a year ago. A year ago I wouldn’t go out of my depth at all. I had to be comfortably in my depth to be happy in the water but then I would get bored easily as I couldn’t swim, I wouldn’t put my face in the water and I just really wasn’t happy with the water side of any holidays. This meant that on our holidays before kids to the Dominican Republic, Egypt and Tunisia, as well as our honeymoon to Mexico I watched Dave snorkelling and swimming. I watched him do so much and I just didn’t have the nerve to participate. I was terrified of drowning, terrified of the sea and much happier sitting in a kayak watching him snorkel with sea turtles with the rest of the group. But, it left me feeling sad that I hadn’t experienced everything I possibly could. Then the children came along and I made an effort to get in the pool, but would get out swiftly afterwards, knowing that I would be next to no help if they got in trouble in the water and preferring Dave to be there with them, keeping them safe. But soon the children could swim better than me anyway, and I was happy in the knowledge that they knew water safety, they knew how to swim and they were sensible around water. But, it made me so emotional watching them swim. 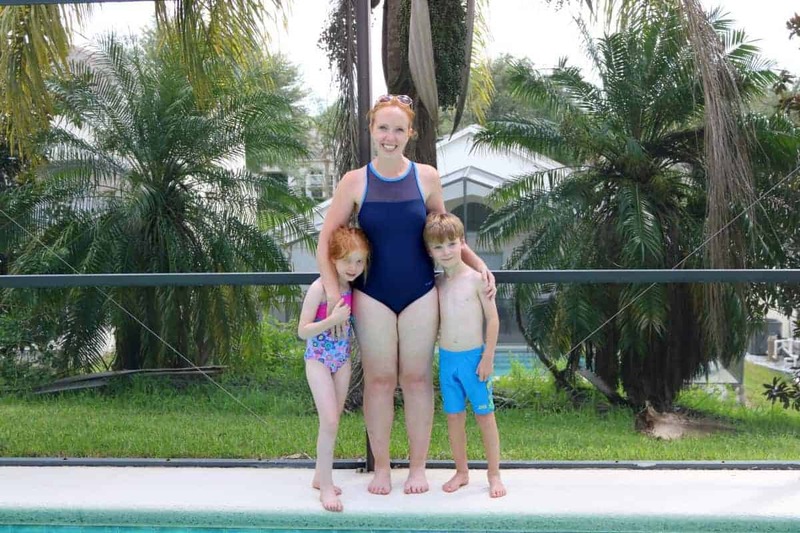 I loved that they had this new found confidence, I loved how much fun they were having but I felt so sad that I couldn’t enjoy it with them – or even enjoy the same things my children were enjoying as I didn’t have the confidence or skills. So I learnt to swim and when we flew out to Florida I packed my swimwear happily. I knew with complete certainty that I would play in the pool with the children this summer and I just could not wait. Zoggs actually sent all of us swimwear and goggles to take with us that you’ll see throughout the posts about our holiday. And that is what happened. I played in the pool with the children. We played games and they tried their hardest to teach me more about swimming. I soon realised I couldn’t swim underwater – I just didn’t know how. So the children and Dave – as well as his parents – tried to help me learn. By the end of the two weeks I could do a roly poly in the pool, even a double roly poly, and I had done handstands too. I think if we’d had another week there I would have started to get better at being underwater but by the end of the two weeks I knew with complete certainty that I could swim and that I was happy in the water for the first time in my life. 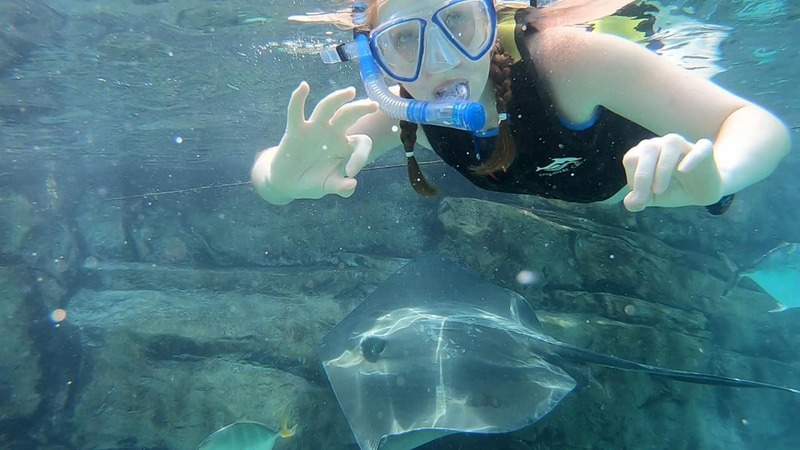 A huge part of the holiday for me was when we went to Discovery Cove. I wanted to snorkel and I knew this was the time to do it. There have been so many times I missed an opportunity to snorkel but that was about to change. So I grabbed a snorkel and mask and followed Dave and the kids into the water. I was prepared for it to be difficult, for it to feel unnatural and for snorkelling and swimming at the same time to be hard work. But it wasn’t. It felt so nice to have my face under the water and not have to think about breathing. 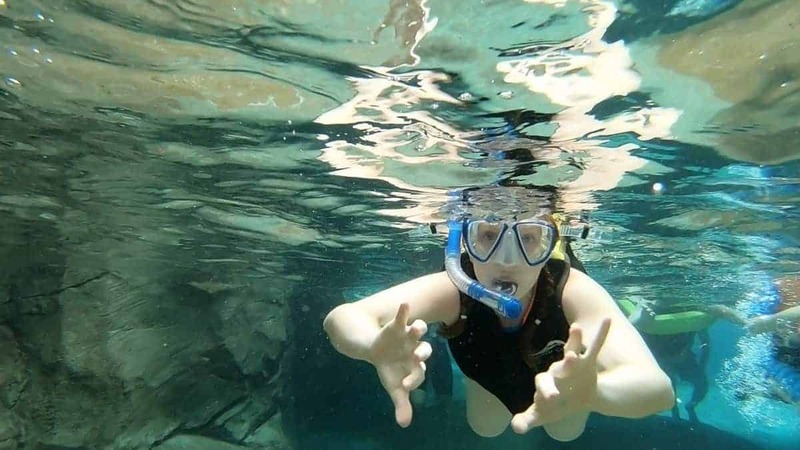 It was amazing to see under the water and I was just so happy. At Discovery Cove there was a reef to snorkel and Dave, his Dad and I went over there to have a go. The children didn’t want to – they didn’t like the idea of fish being around them – so the three of us went there instead. I was immediately faced with my biggest fear – being out of my depth – but I knew I had to get past it. To get into the main reef you could either wade into the water, through the many tourists and try and find a free area or you could swim off a ledge into water that was around 10 feet deep. I stood on the edge and told myself that the water didn’t want to swallow me up – that water actually wants you to be out of it. It wants to push you up, it wants you to float. So, I swam off that edge, put my face in the water and hoped that I wouldn’t sink. And I didn’t. Instead I swam. I swam in circles and I watched the fish below me. I don’t think I have ever been as proud of myself in that moment. I could have cried at everything I had missed out on during our previous holidays but instead I thought about everything I could now experience. I felt such amazing freedom and looking down at the fish below looked like a whole new world. 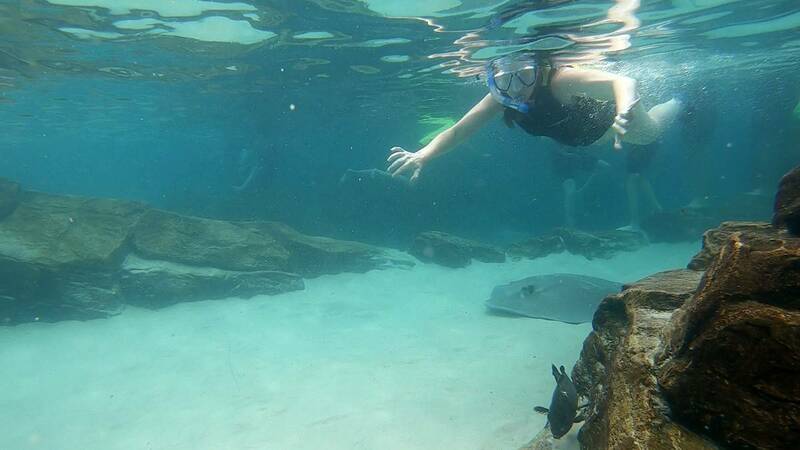 Rays swam right next to us. Fish were here, there and everywhere and there was even a glass wall you could swim up to that had sharks on the other side. It was incredible. I could not believe that things like this were right there and I had never experienced them before. Afterwards I swam to the shore with Dave and gave him a hug. He could see how happy I was and I told him how I felt like I just had to have faith in the water – and that if I stayed calm and relaxed the water would keep me safe. I sound a bit like a hippy. But, it’s worked for me. I never expected to be able to swim with the children and I really never expected to be comfortable swimming out of my depth but I can do it. And, the biggest part of it for me was learning to float. It was also learning to put my head under the water and relax, pushing my body down into the water and feeling the water push me back up. I think learning to swim as an adult is so much to do with getting over the fear of the water and having trust in the water. Once you manage that anything is possible. When you learn as a child swimming is just something you do – not much thought goes into it. When I asked Dave how he swims underwater he couldn’t explain. It’s just something he does without even thinking about it. I feel like I now have so much to experience. I feel like I have come so far since July. I can now happily jump into a pool – with no grace at all – and I can be comfortable out of my depth in water – although I prefer to be horizontal as being vertical and out of my depth still makes me panic so I’m focusing on one thing at a time. I can float happily and I can swim. I really can swim and it really has changed my life. I’m now looking forward to our next holiday and to doing a trial scuba dive session in a pool at the next opportunity. I’m really never going to miss out on anything again. So pleased for you, it’s brilliant how well you’re getting on with swimming and it really is life changing. Being able to swim has given me so many opportunities and it’s brilliant that these are now open to you too.